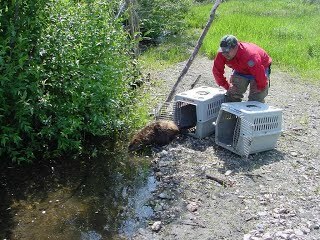 Nuisance beaver are sometimes moved to locations more desirable. We will introduce the potential approaches or limitations of working with beavers to set the stage for more specific considerations when designing a conservation or restoration program involving beavers. Hood G and Bayley S. 2008. Beaver (Castor canadensis) mitigate the effects of climate on the area of open water in boreal wetlands in western Canada. Biological Conservation. 141(2): 556-567. DOI: 10.1016/j.biocon.2007.12.003. McKinstry MC and Anderson SH. 2002. Survival, fates, and success of transplanted beavers, Castor canadensis, in Wyoming. Canadian Field-Naturalist. 116(1): 60-68. Tippie S. 2010. Working With Beaver for Better Habitat Naturally!, Wildlife 2000 & The Grand Canyon Trust, Flagstaff, AZ, 30 pp. Available: http://www.grandcanyontrust.org/documents/ut_workingBeaver2010.pdf.